Who needs cute bear or cat plushies? 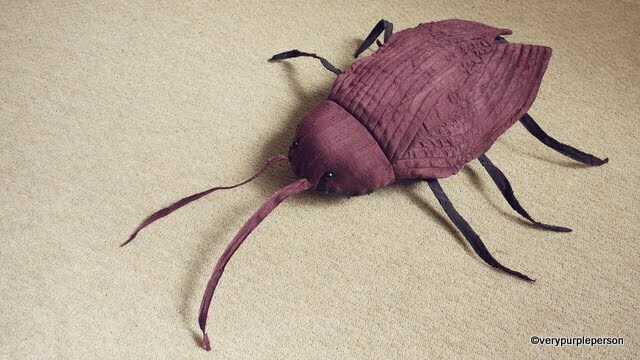 I’m sure every boy would love a huggable cockroach! This is Sidra’s favorite toy at the moment, he calls it Gokiburi-kun (gokiburi means… well, cockroach). 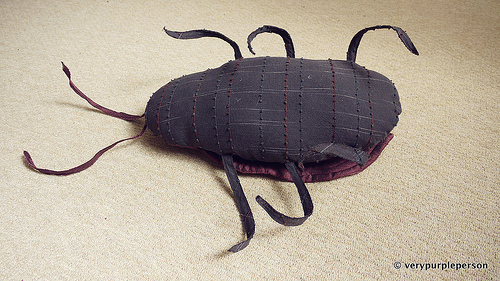 The cockroach is basically just an oval shape pillow with legs. The wings and head are made with leftover dupioni silk that I dyed brown. The original color of the silk was silver, and the shimmers would make a perfect cockroach. 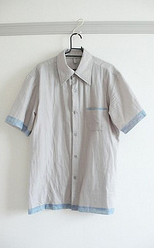 The body is made with cotton/linen fabric with interesting texture, leftover from my husband’s shirt. Fancy your own giant cockroach? Carry on! Disclaimer: For personal use only. Please do not pass off the pattern and tutorial as your own. Thank you! Don’t you hate it when it happens? Note: seam allowances are NOT included. You have to add it before cutting fabric. Fabric scraps. 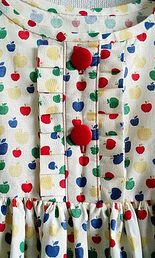 You can mix and match fabric in different pattern and shades. scrap of quilt batting for wings. thin wire for the antennae and legs. I use thin plastic wire because they’re very soft and won’t poke out. Cut fabric pieces from pattern: 1 head, 1 body, 1 underside, 4 wings. Don’t forget the placement marks. Cut 2 pieces of wings from quilt batting. Cut 12 fabric bias strips for legs: 2 x 22 cm. Cut 4 fabric bias strips for antennae: 2 x 28 cm. Place each pair of wing pieces with right sides together. Put batting on top and sew around the wings, leaving the top open. Clip curves around and turn wings right side out. Batting is now sandwiched between fabric. Sew rows of stitches on wings, 1 cm apart. 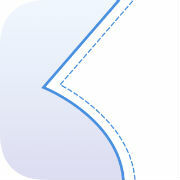 Use the outer curve as guideline and continue inwards. Place a pair of strips wrong sides together. 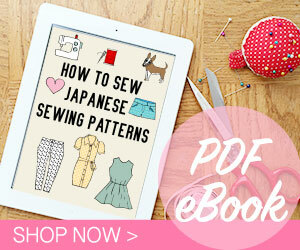 Make 2 rows of stitching, approximately a sewing foot apart. 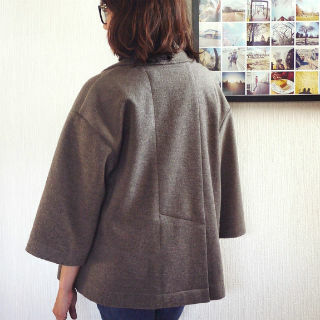 Tapered the stitching lines to meet at the end, making a pointed shape. Backstitch at the end to reinforce. This will create a tube with closed end. Measure each leg and cut 18 cm from the pointed end. Measure antennae and cut 24 cm from pointed end. Trim allowances close to stitching. Insert thin wire into the tube. Place wings on the placement marks on body. Baste the top. Sew the body and head together. Place legs and antennae on the placement mark on the underside piece. Baste in place. Place body and head piece over the underside piece, matching all placement marks. Sew all around, leaving the opening unstitched. Be careful to not catch the wings and legs when sewing. Clip curves around and turn cockroach right side out (eww). Fill the cockroach with your choice of filling. I personally think that the roach would look better without eyes, but Sidra was concerned that his roach wouldn’t be able to ‘see’ so he asked for a pair of eyes. You can shrink or enlarge the pattern to make more roaches! Here’s my prototype roach made with leftover wool. 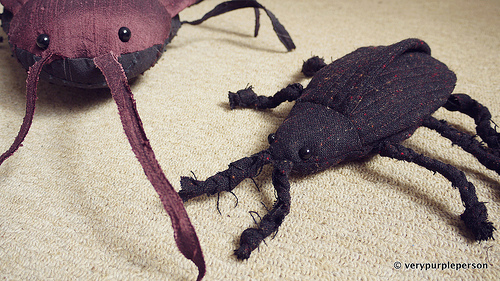 The legs and antennae are braided fabric strips. One cockroach is not enough! Pattern and tutorial by Novita Estiti c 2011.